To Mama Santa’s Restaurant for her favorite pasta with family and friends. There are times when I become overwhelmed with everyday life and wonder where I will find the time to continue volunteering as I’ve been doing for almost 20 years now. Then suddenly, I get a phone call that changes my perspective and reminds me why our small group of eight remains diligent in its efforts. That recent phone call came on a Wednesday, from a hospice social worker with a frantic request. 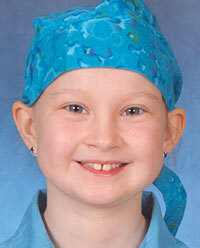 One of her patients, a 10-year-old girl named Sara Hudson, was dying. Sara very much wanted to go to Mama Santa's in Little Italy with her family and friends. When asked why she had wanted to go to Mama Santa’s, her mom said because her grandparents would take her there after chemotherapy when she was feeling good enough to eat, and pasta and meatballs were her favorite. I went to Mama Santa’s and made all the arrangements for a dinner celebration for 35 people, to include food, balloons and a special Scooby Doo balloon and princess ring in Sara’s favorite color. We were all set—friends, neighbors, grandparents, aunts, uncles, big sister, best friend and mom were all coming to dinner with Sara. A limo was scheduled to pick her up at 5 pm, when I received a call from Sara’s mom saying Sara was too sick and sleepy to go to the restaurant. When her mother told her the trip would have to be cancelled she was understandably upset. But what if we bring Mama Santa’s to Sara? "Of course," I said. With some quick adjustments it was decided, the limo would take everyone, including Sara and her oxygen, and ride down to pick up the food. The generous staff at Mama Santa’s loaded all the food and balloons into the limo. I met Sara in the limo where she was sitting with her Scooby Doo pillow and a smile on her face. She told me she loved the limo ride and loved having her family and friends with her. I put the princess ring on her finger as she took in the smells coming from the bags filled with the pasta and meatballs she had requested. She told me she was going to eat it when she got home. The entourage made it back to Sara’s house, carried in the balloons and food, and had a special party. Sara’s mom said although Sara was sleepy and had her eyes closed, she could hear the sounds of her family and friends enjoying a dinner planned by her and she had a smile on her face all night. She passed away at 2:30 the next morning. The Hudson family was surrounded by their closest family and friends, all orchestrated by a little angel named Sara. 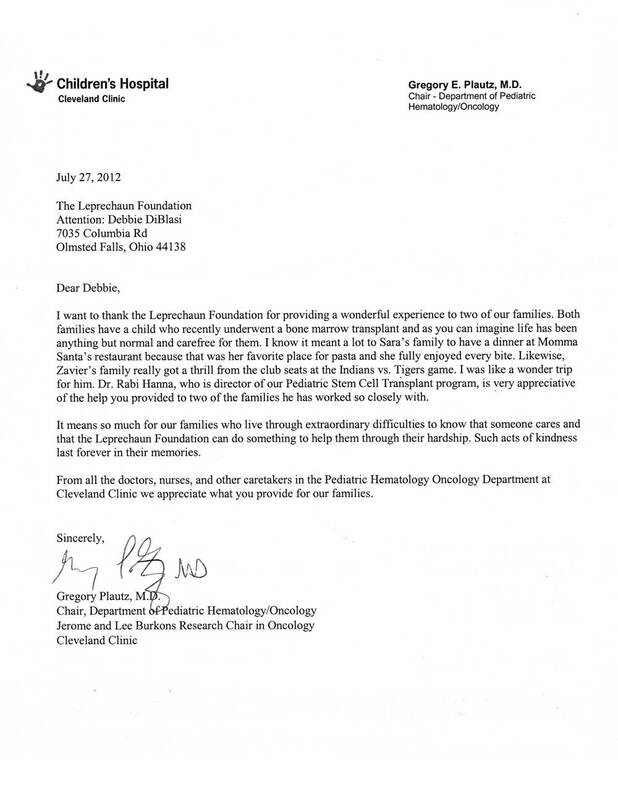 The Leprechaun Foundation is a nonprofit, tax exempt, 501(C) charitable organization.